We are excited to shine a spotlight this week on 3 highly distinguished and historically unequaled varieties of Beech, Fagus sylvatica, Fagus sylvatica ‘Pendula’, and Fagus sylvatica ‘Asplenifolia’. Fagus sylvativa, commonly known as the European Beech, is a stately and breathtakingly ornamental specimen. Widely regarded as a native of Southern England, evidence suggests it first made an appearance there around 4,000 B.C. 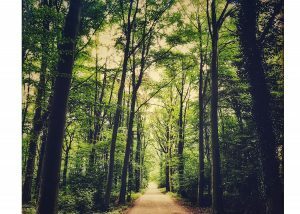 Aptly referred to as Adonis, or the Hercules of European forests, its roots stem from central Europe, southern Norway to Greece, and France to the Caucasus mountains. Though its initial presence in the US is unknown, it appeared in the first decade of the 1800’s at the present site of Rockefeller Square in New York City. It has been noted as appearing in a nurseryman’s catalogue in 1820, yet the oldest and largest grove can be found in a 2.5 acre public park in Brookline, Massachusetts. They reach an average full height of 50’-70’, and a nearly equal girth at around 40 years of age, though some specimens have been known to soar to heights of up to 100’. Specimens have an average 300 year life span, though some have been aged of up to 500 years. 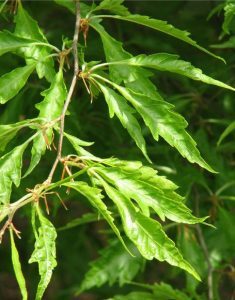 Fagus sylvatica can be difficult to transplant, preferring acidic, moist, sandy, deep, and well drained soil with full sun. It’s an excellent shade tree, is deer tolerant, and squirrel friendly. The grey bark is lovely, delicate and thin. Yet, in specimens of advanced age, it develops a distinct texture, not unlike that of elephant hide. Its flowers are monecious, producing edible beechnuts that all creatures great and small have long made use of as a reliable protein source. 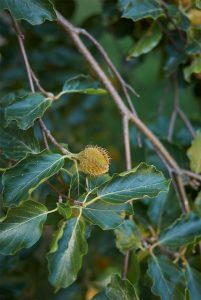 The husk of beech nuts have a Velcro-like texture, aiding in propagation by attaching to the fur of passing fauna. 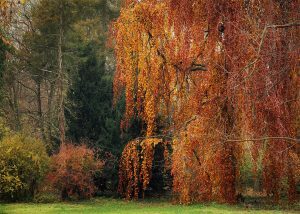 The Fagus sylvatica ‘Pendula’, known familiarly as the Weeping Beech can be distinguished from it’s predecessor by it’s long, sweeping, willow like fronds. A low maintenance planting, it needs a medium amount of water and though it also likes well-drained soil, it is more soil tolerant than it’s American relative, Fagus sylvatica ‘Asplenifolia’. Possessing the characteristically delicate, smooth grey bark of the beech, the luxurious sweeping branches have a dramatic downturn, giving it a Pocahantus grandmother willow-like feel. The Fagus sylvatica ‘Asplenifolia’ has a lighter grey bark than that of it’s European relative. It is faster growing as well, by about 10 years, with a distinctly fern-like appearance. Because of this, underplanting is not recommended. It’s large, bush-like appearance, owing to its dense pyramidal growth structure gives it a width that often matches it’s height. It is more tolerant of warmer climates and easier to transplant with shallow roots. In line with the family tree, the bright, smooth green leaves mature into a golden yellow in autumn. All of the species of Beech mentioned herein owe their longstanding countenance and resiliency to their hearty fortitude and resistance to insect and disease problems. 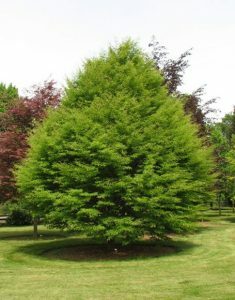 The Royal Horticultural Society’s Award of Garden Merit needs no introduction, and the Fagus sylvatica, Fagus sylvatica ‘Aplenifolia’, and Fagus sylvatica ‘Pendula’ have all received it’s venerable stamp of approval.